Mother and child were buried within a week of each other at Sydney Cove in April 1788. The child Rebecca Bolton/Boulton was born in Lincoln Gaol around April 1786 as her mother Rebecca awaited embarkation on the Prince of Wales. It was stated at her trial, that as Rebecca Gibson, she had married Thomas Bolton at Panton Lincolnshire in 1778. Rebecca, was aged 23 when tried at Lindsey Quarter Session at Spilsby Lincolnshire on 16 July 1784. She gave a voluntary confession on 8 May 1784 as the wife of Thomas Bolton of Thimbleby, labourer; who confesses and says that she is a servant of Mr John Grant of Withcall in the said parts Grazier, and says that last Tuesday morning about four o’clock she left her said Service and took and carried away a Cotton gown and a silk handkerchief the property of Ann the Daughter of the said John Green, and also did take and carry away a Cotton apron the property of the wife of the said John Grant, and also did take and carry away a Cap and a Ribbon the property of Lucy Holmes Servant to the said John Grant and also did and carry away a Black Silk Hat and a pair of Leather Shoes and a Black Silk Handkerchief the property of Margaret Waltham Servant to the said John Grant. John Grant the Younger of Withcall Yeoman (bound) in 20 £ For his Appearances to prosecute Rebecca Boulton Wife of Thomas Boulton of Thimbleby Labourer for stealing a Cotton Gown and Silk Handkerchief the property of his Sister Ann Grant and a Cotton Gown the property of his Mother Ann Grant and to give Evidence. Discharged. Jonathan Merriken of Louth Labourer (bound) 10 £ for his Appearance and to give Evidence against the said Rebecca Boulton as above. Discharged. Bills Found. Bill against the said Rebecca Boulton for a petty Larceny. Rebecca Boulton. Transportation. Whereas at the present Sessions Rebecca Boulton, Wife of Thomas Boulton hath been convicted of a felony for which she is liable to the penalty of burning in the Hand or Whipping. It is Ordered by this Court that the said Rebecca Boulton be transported, as soon as conveniently maybe, to some of his Majesty’s Colonies or plantations in America for the Term of Seven Years to be computed from the Time of the conviction as aforesaid. Following the trial Rebecca was held over in the Gaol at Lincoln Castle. In the 18th century it was run as a private business. Prisoners had to pay for their keep and unscrupulous gaolers charged excessive fees for food and bedding, and were locked up together in filthy, crumbling dungeons and buildings without fresh water or sanitation. In this situation Rebecca most likely had to rely on Thomas and others for her daily needs during the three years she was prisoner. Her child was conceived in Lincoln Gaol and born there in April 1786. As preparations were being made for embarkations on the First Fleet convict transport ships, the Gaoler in Spilsby, Lincolnshire, wrote to the authorities on 30 December 1786 seeking permission for Rebecca to take her child onto the First Fleet. He wrote she has a Female Child about eight months old, should be glad you’d inform me Wether the child can go with the Mother, she being very desirous to take it. Permission was granted on 22 March 1787, just in time to keep them both together. They were delivered to the Prince of Wales on the 25th – At 8 PM the Turnkey of Lincoln Gaol Bought on Board four female convicts & a child. Rebecca’s occupation was recorded as servant. Possibly the years Rebecca was confined within the Lincoln Prison contributed to her failing health. 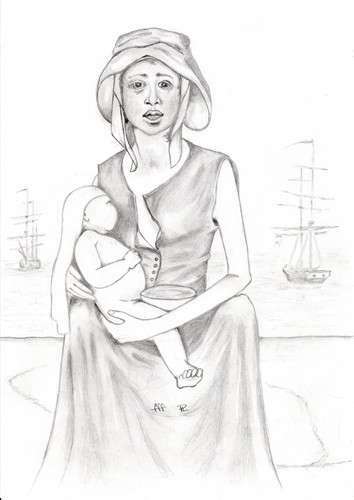 Her baby Rebecca also became sickly, as four months following their arrival in Sydney Cove, Rebecca Boulton a convict, was buried at Sydney Cove on Tuesday 21 April 1788. A week later on Monday 28 April, Rebecca Boulton, a convict’s child was buried.